With the wide range of experience we presnt you the best quality and cost effective Pipe Bending Equipment. Hydraulic Plug Mandrel offered comes in precision designed and constructed finish and find suitability for pipe sizes of 8″ to 18″ in specific thickness range. 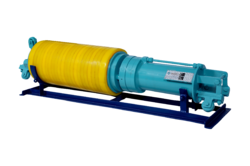 Further, these highly functional hydraulic plug mandrel provides for 360° support to inside surface of pipes. Some of its features include allowing for more degree of bend, without wrinkles; comes with pull type operating system can be provided with support of conversion kit for other pipe sizes and wall thickness range within same model at extra cost. Shree Shakti Engineering engages in manufacturing and supplying a wide range of Hydraulic Plug Mandrel. Hydraulic Plug Mandrel is used in Pipe Bending Machine for bending pipe. Hydraulic plug mandrel allows more degree of bend, without wrinkle. Hydraulic Plug Mandrel is available sizes from 8” to 18”. Available in size from 8” to 18”. The SHREE SHAKTI ENGINEERING is topmost manufacturer of wide range of Hydraulic Plug Mandrel. Our Hydraulic Plug Mandrels are vital piece of equipment for any pipe bending operation using high grade technology and material. SSE’s self-centering/ Non roll technology ensures that the mandrel will always stay centered in the pipe. Designed and engineered for a one man operation. 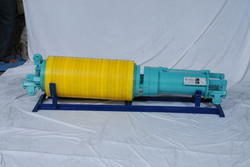 Hydraulic plug mandrel is used to internal support of 8” to 60” diameter. The user friendly design does not require side roll adjustment. The larger mandrels offer a very strong actuation system using two large pneumatic cylinders pushing and pulling mandrel into position. Equipped with12 meter reach rod, control ends and owner’s manual. Hydraulic plug mandrel is available to suit pipe sizes 6 to 20 inches which specific thickness range. Conversion kit will be available for other pipe sizes and wall thicknesses within the model size available with extra cost. Allows more bend, without wrinkle, to be used with 6 to 20 diameters. Extremely powerful large diameter cylinder. Fast action – retracts, expands and travel quickly. Rugged and built for long life.